You need to know 50 muscles for the Level 3 Anatomy and Physiology Exam. The chances are you have taken one look at the MUSCLES section and closed the manual again. Maybe you feel overwhelmed with dozens of origins and insertions to learn, staring at your course manual, and endless Latin words for hours on end, whilst nothing seems to go in...! Most people find it frustrating to learn from reading a book or manual. Consider the possibility that learning the muscles for your exam doesn't need to be laborious repetition of reading the same table of origins and insertions over and over again. Most people remember things by using their visual and auditory memory and attaching meaning to what they see and hear. Something every course manuals lacks! If I ask you what the colour was of the front door on your first ever house. You will seek for a visual image, and hear yourself recalling the colour of the door. Your brain already holds this information, we just don't require it all the time. Recalling the muscles works the same way, but first you need to construct a visual image so you can recall it during your exam. This is exactly what these flashcards do. They will give you a clear image of the muscle, highlighting the location, joints crossed, origins, insertions and joint actions. These flashcards are mapped to the Active IQ, CYQ and VTCT syllabus, making sure you are learning exactly what you need to for your exam. We've made learning stress free and fun! 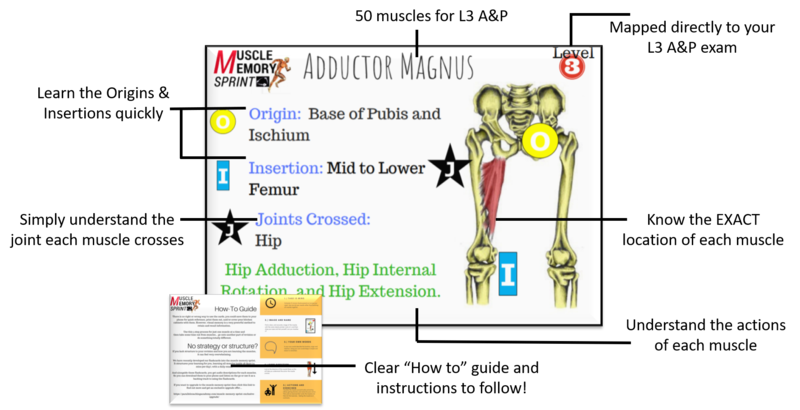 50 Muscle Flashcards - Instantly Download to any device, meaning you can learn anywhere, anytime! You need to know 50 muscles for level 3 A&P exam. Each flashcard is mapped to the main awarding body's (Active IQ, YMCA and VTCT). Muscle Memory Cheat Sheet - Outlining every muscle you MUST know, unseen mock questions and CLEAR guidance of muscle to focus on! What are the 50 muscles you MUST know for your Level 3 Anatomy and Physiology Exam? The 50 Level 3 Muscle Memory Flashcards are usually £20, but today, you can get all 50 for £15.00; saving you 25%. You get Instant and Lifetime Access to your flashcards using your Parallel Coaching Academy. Your login details will be sent immediately after payment. You'll also get a "HOW TO" guide to using your flashcards and a BONUS Muscle Memory Cheat Sheet to test your knowledge. NO repeat payments or monthly fees. 1) Fill in the form below and click "Add billing method"
2) Add your card details, click "add £15.00"